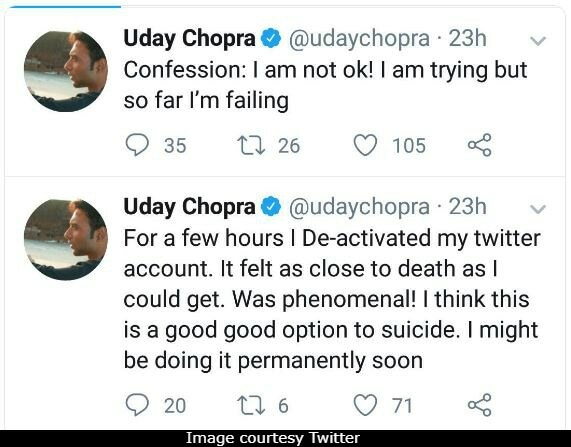 Uday Chopra had social media all a-twitter, if you will, after tweeting "I am not ok" and mentioning suicide over the weekend. He later deleted his tweets and posted a clarification dismissing them as 'dark humour' and insisting he is actually 'totally fine.' Worried fans heaved a sigh of relief and have left the former actor messages of support. "Sir, please don't do it again. I don't think anyone saw it as humorous in any shade of gray. It shakes us as fans and as humans to see fellow people under chronic stress. Hope you stay fit, hale and hearty for long. Wish to see you on the big screen again soon," read a tweet while another added: "That's wasn't a dark humour at all. Well it's good that trying times are over." 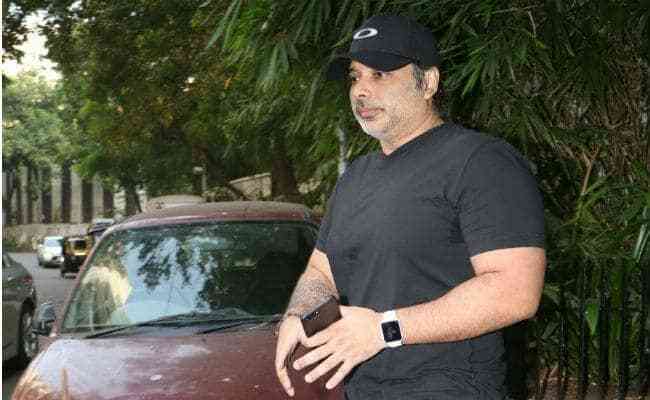 Uday Chopra's normally cheerful Twitter went alarmingly dark on Sunday after he tweeted "For a few hours I deactivated my Twitter account. It felt as close to death as I could get. Was phenomenal! I think this is a good option to suicide. I might be doing it permanently soon." In another tweet, he wrote: "Confession: I'm not okay. I am trying but so far I'm failing." Instantly deluged by concerned comments, Mr Chopra deleted his posts and shared this casual explanation: ""Seems like I tweeted something recently that got a few of you worried. I'm totally fine, it's just my dark humour that sometimes gets misunderstood. Thanks for all your concern though." Some fans seemed reassured, others didn't think it funny in the least: "It was rather scary Uday. All your fans are rightly worried after reading you tweeted about a suspected attempt to end life," read one response. Seems like I tweeted something recently that got a few of you worried. I'm totally fine, its just my dark humour that sometimes gets misunderstood. Thanks for all your concern though. I don't know much about acting,but you are not good with philosophy. That's wasn't a dark humour at all. Well it's good that trying times are over. Screenshots of Uday Copra's deleted tweets were circulated on social media amid speculation that he may be suffering from depression. He has, in fact, posted generally about mental health in the past. Last year, he tweeted: "If you or a loved one is suffering from a mental illness, get help. Remember you cannot will it away. You cannot just 'think positive' or 'shake it off' or 'be strong'. It's the same as asking a person with a broken leg to just walk it off. There is no shame in it. Help is available." Remember you cannot will it away. You cannot just "think positive" or "shake it off" or "be strong"
Uday Chopra, star of films such as Mohabbatein and Neal 'n Nikki, was last seen in Aamir Khan's Dhoom: 3 in 2013. He then quit acting, telling IANS in an interview the following year: "That's over. My focus is not there. Also, I don't have time to act." Mr Chopra now runs the Yash Raj Films' subsidiary YRF Entertainment.